A super boy fighting against ASD & T21: ¡FELIZ NAVIDAD! MARRY CHRISTMAS! This Christmas was very special to me because we started our own Christmas tradition. We will keep Baby Jesus figurine in a secret place and Tommy will put Baby Jesus in the Manger every December 25 in the morning until Tommy gets older. My sister and I used to put Baby Jesus figurine at 12 am every December 25 in the Manger because it was when baby Jesus was born. When my sister and I had our first Nativity, it was the most exciting experience for us because we made it by ourself. It was a Nativity Paper doll book. We had to color everything (animals, characters, houses, trees, and so on). We cut all figures and we used too much glue to keep the paper dolls in place. We added our imagination, too! We put Christmas lights and "musgo" to represent the vegetation. We put manila paper to create the mountains and the streets of our first Nativity. We borrowed a table from our grandma to display our First Nativity in the living room of our house. Mom always supports us even in our craziest ideas, she was proud of us for our initiative to have a Nativity. I remember the book was sold for the biggest Department store in Panama, "El Machetazo". Our first Nativity wasn't that pretty, but it's the most memorable Nativity I have ever had. After our first Nativity, my sister and I made the decision to continue the creation of our own Nativity every year; and not for seven years as it was the original tradition by our grandparents. We designed the houses, church, bridges, streets and so on. We got collectible figurines made in Italy that were sold in "El Machetazo". I was in charge of the creativity of our Nativity since I was 7 years old. My sister and I continued our promise until the last Christmas before I came to the USA. I will heritage this tradition to my son. 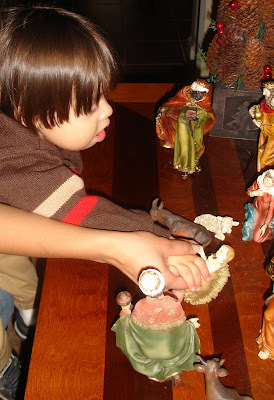 He will use his imagination and skills to do every Nativity memorable, as I did when I was a child. Bellow are photos of a Nativity, which is display in a local Mall in Panama City, Panama. My dreams is one day to create a big Nativity as it is display in the photos below. I LOVE the tradition you are inspiring for Tommy to continue! The Nativity scenes in Panama are magnificent!